From beauty pageants to commercials to soap operas to the big screen, actress Crystal Hunt has mastered it all. Hunt’s passion and commitment started early when she was spotted at an Actors Workshop, which led to opportunities in the small screen on – not just one – but two of the most-watched soap operas of all time: Guiding Light and One Life To Live. Most known for playing the troubled daughter Lizzie Spaulding on Guiding Light, Hunt was awarded a nomination for Outstanding Younger Actress in a Drama Series. She then went on the the big screen where she has worked alongside such actors as Zac Efron, Matt Bomer and Channing Tatum. Most recently Hunt explored life behind the cameras as an Executive Producer. 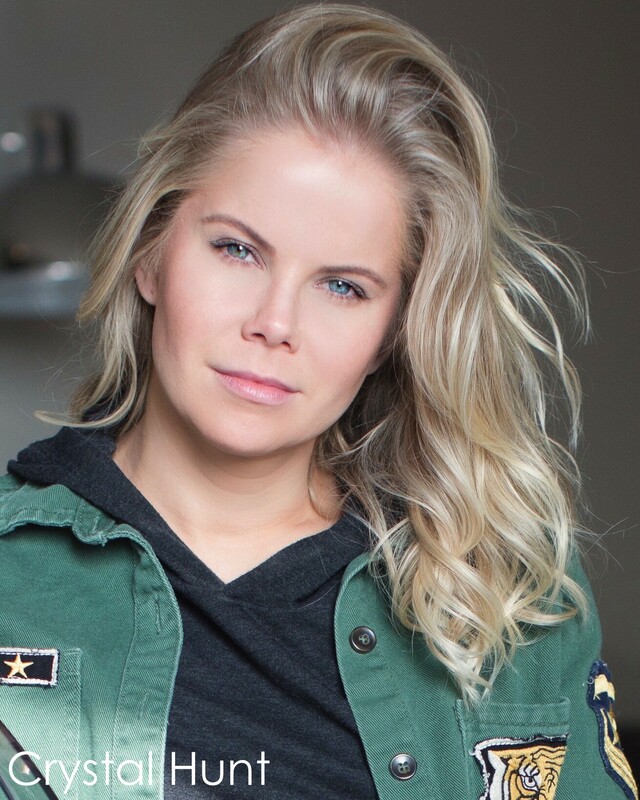 The Overhead Compartment met up with Crystal Hunt to learn about life in front of and behind the camera, and what it’s like to literally grow up in the middle of a soap opera. OC: You have been on two dynasty Soap Operas: Guiding Light and One Life To Live. What’s the best thing about being on a soap opera? CH: It’s a lot of work. You’re talking about 60-80 pages of memorization a day. I thought it was a lot on CBS when I had 30-40 pages, but then on ABC having 60-80 pages was a bit shocking. OC: What was the biggest difference between the two experiences? CH: Well they are very different as the cast of One Life to Live was so much larger than Guiding Light. There were only so many contract characters on Guiding light, so it was more intimate and became more like a family. Where OLTL they were always cranking out episodes and while you would become close with these people, it wasn’t the same intimate experience. OC: How do soap opera fans react when they meet you? CH: They often say, “Oh my gosh, you’re really nice.” Because I often played the bad girl. Some people would be waiting outside the studio after shooting and would try to save me. OC: You also co-starred in the movie The Derby Stallion with Zac Efron right before High School Musical came out. Did you have any inkling he would become a major star? CH: I could definitely see it. We became friends on the set and he was at my 21st birthday. He is a really good guy and so are his parents. Obviously he is a handsome guy, we could see it all happening, but we also knew he would remain that funny and normal guy. OC: You recently went behind the camera as Executive Producer on the horror thriller, Lycan. What was the experience being behind the scenes for someone who has always been in front of the camera? CH: I have a whole new respect for it. There are so many things that you don’t expect that you have to deal with, and in the midst of actually performing your task and your jobs that you have to get accomplished that day. So many random things that come up that you don’t expect. OC: What is the secret to keeping your feet on the ground in Hollywood? CH: Knowing who you are and having a strong support system and strong family that from day one always make you feel confident in yourself and remind you all the time that you can do anything. Never make you feel like your dreams and aspirations are not attainable. My parents never made me feel that anything I wanted to do was silly, they always encouraged me, even if it was a crazy idea. OC: What’s the most exciting place work has taken you? CH: Working in Savannah on Magic Mike was really cool. It’s such a historic town and one of those places you may not spend six months of your life, but it was a great time to get to know the city. There are a lot of haunted locations and they talk about how the spirits linger in so many places. OC: What was it like working on the set of Magic Mike? CH: Oh it was so much fun. And getting to work with Matt Bomer again was great. He was one of the first people I met when working on Guiding light when I was 17. When he would have scenes I would always come on set and sit across from where they were filming and watch his work because he is so not predictable and so natural. He is such an amazing human being. But everybody in the cast of Magic Mike was so nice, the actors and directors, everyone got along like good friends. CH: Well, I am allergic to down so I usually call and make sure there is no down in the room. But I usually turn on a humidifier that I travel with along with a candle. I’m not crazy about the hotel scent that all hotel rooms seem to have, so I light the candle to be sure and get out the scent. CH: Forbes, my dog. He is a Yorkie and he goes everywhere with me. Every set, everywhere I travel, he is my sidekick. Crystal Hunt, please use care upon departure as items may have shifted in The Overhead Compartment during our journey. Thanks for choosing us for your travel tips! Have a wonderful day!